LUCKYFINANCES is the online platform of the international investment company Lucky Times Limited, registered in the UK. The company Lucky Times Limited is the embodiment of the effectiveness of the mining of crypto-currencies and successful transactions on the crypto-exchange markets. Hence, the Company's revenue is formed. We managed to achieve such successes primarily due to the fact that our employees are outstanding programmers, stock traders and economists. We gathered our team, uniting in the collective of each person the idea of ? ?promoting technology, crypto-currency. All our achievements have become possible due to the correct strategy of investing in ASIC systems, as well as due to the competent use of our team's human resources. The officially registered activities and highly intellectual composition of the team team have created the foundation for our progress and prosperity. The company has been developing steadily since 2017 and daily expands its investment network in different parts of the world, significantly scaling investment activity. With the launch of the online platform LUCKYFINANCES, participation in the Company's investment activities became available not only for Russian-speaking investors in Russia and the CIS, but also for European investors. The basic income of the platform and investors is formed on commission when investing in crypto currency exchange operations, as well as in the purchase and sale of crypto-currencies at the largest crypto-exchange exchanges. 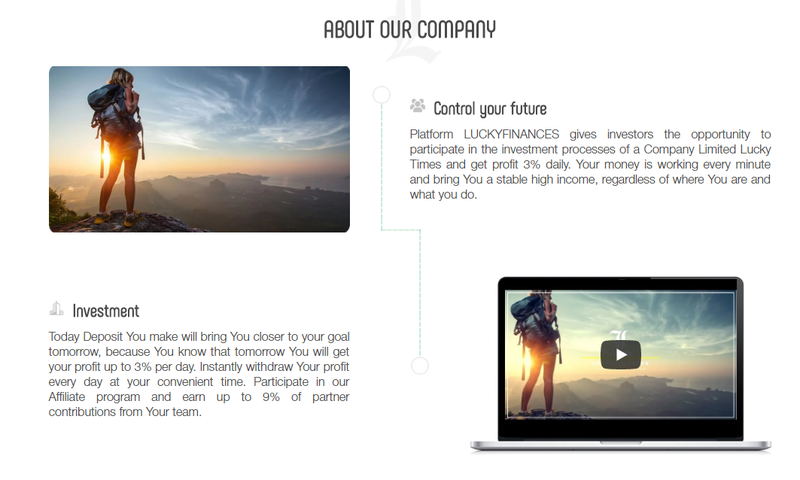 The LUCKYFINANCES platform provides an opportunity for individuals to directly participate in the investment activities of Lucky Times Limited, without the risk of losing investment. 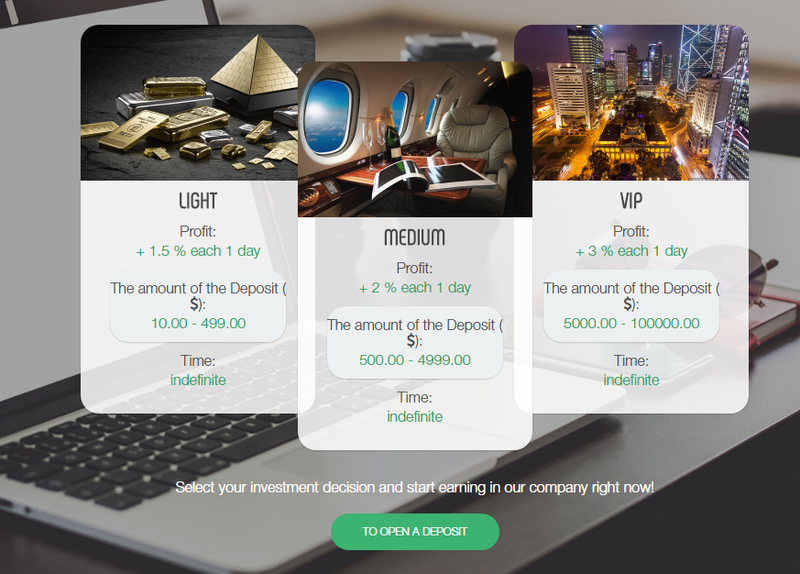 The profit of investors can reach 3% per day. The official website presents 3 tariff plans with a yield of 1.5% to 3% per day. Each investor can choose a tariff plan suitable for him.